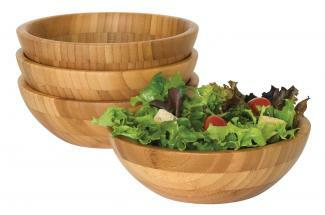 Bamboo houseware supplies are ideal for people who are interested in combining green living and style. The natural qualities of bamboo make it a great option for people looking for attractive, yet hard wearing, household items. Bamboo houseware supplies include many items for the dining table. Bamboo mats and coasters are ideal for protecting a table from general wear and tear during busy family dinners or special parties. These placemats and coasters can be found in many shapes and sizes, from small circular discs that are suitable for a wine glass to large centerpiece mats that are perfect for a large serving dish. 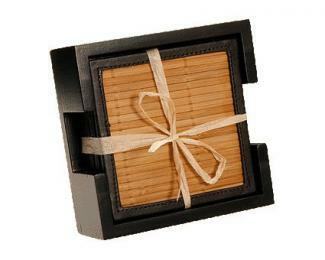 Thirstystone Bamboo Coasters are a great choice for protecting furniture. The bamboo of these coasters actually absorb liquids so there is never any mess from condensation off a glass even on the hottest days. Each of the coasters is backed with faux-leather to further protect furniture from scratches. Get six for about $15. Bamboo baskets are extremely practical and can be used for storage as well as for shopping trips. Bamboo is extremely hard-wearing, making these suitable for use in high traffic areas such as the kitchen. The baskets are created in a variety of sizes making them ideal for storing one or two small items to storing a large amount of miscellaneous items. SaveOnCrafts carries inexpensive bamboo baskets measuring 6.5- by 4-inches with a 9-inch handle. Each of the lightweight baskets comes with a plastic liner for the interior so you can use them to store wet objects or liquids without staining or warping the wood. 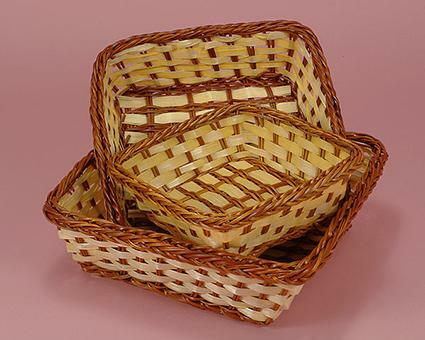 The baskets have straight-slat sides and a woven bottom and retail for about $4 each. Get square, two-tone bamboo baskets with no handles from Paper Mart. These baskets are handmade from all-natural bamboo, which means that each basket has some subtle variation, making each one unique. The baskets come in three sizes ranging from 6- to 10-inches with prices starting at around $12. Bamboo looks wonderful when wound into bowls and vessels. These have many purposes and are suitable for decoration as well as for general everyday use. The bowls are wound from strips of bamboo and this gives the bowls and other vessels a unique inbuilt pattern. Every item is slightly different, reflecting the way that it is produced and the fact that it is completely natural. Lipper International makes solid bamboo bowls. Each bowl is roughly 7 inches wide and just over 2 inches tall. A set of four sells for just under $20. Get the coiled bamboo salad bowl from Bambu. The bowl is painted on the exterior to let the natural grain and color of the bamboo show up on the inside. The bowl is finished with several layers of foodsafe lacquer, making it completely waterproof and extremely durable. It's priced around $40. Bamboo can be woven into boxes and organizers that are suitable for storing items. These are ideal for use in an office as well as bedrooms, studies, or other places around the house. The bamboo containers and storage boxes can sometimes be found dyed into a range of colors, which means that they can be chosen for their aesthetic value as well as being highly practical. This bamboo media bin from Stacks and Stacks provides the perfect way to keep your DVDs handy. The box is sized to hold 36 DVDs or 64 CD cases while keeping their labels easily visible. Handles built into the sides of the box make it easy to lift and carry. It retails for around $23. 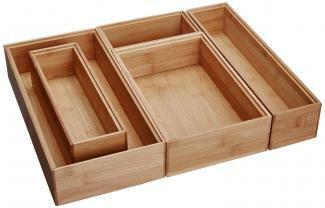 Organize any drawer in your kitchen with these stackable bamboo drawer organizers from the Lipper International. These solid bamboo organizers lock together like a three-dimensional puzzle, allowing you to use the exact number and size of organizers you need for a custom fit in any area of your house. Pricing starts at $4 a box. Kitchen accessories can also be made from bamboo. Items range from steamers to chopping boards, preparation trays, and spoons. Bamboo items are an alternative to wood and they are easy to maintain. The Pampered Chef carries a set of three bamboo spoons that are tougher than traditional hardwoods and guaranteed not to scratch your pots and pans. These durable spoons do not absorb liquids and resist staining, cracking, and warping. They retail for $11.00. 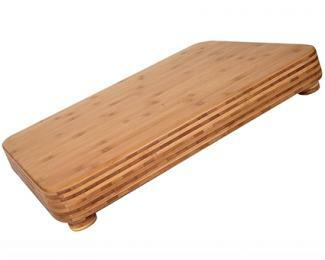 Totally Bamboo makes large, butcher block-style bamboo cutting boards that can be used to roll pastry or do prep work. Totally Bamboo uses only high-quality bamboo from the lower end of the stock, which is denser and more fibrous than the upper portion of the stock, resulting in a denser and longer-lasting product. Pricing starts around $110. 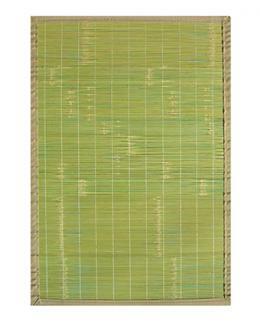 Mats are a popular type of bamboo houseware in eco-friendly houses. Bamboo mats are an excellent alternative to other materials and are an ideal choice for people who are interested in green living. The natural color of the bamboo, combined with its hard-wearing qualities, make bamboo mats a great option for many environments. Bamboo mats are a good option for people with allergies to wool or other fibers. Rugs Direct carries numerous bamboo mats and rugs in a wide variety of different sizes and colors. Shipping at Bamboo Rug Direct is always free, and there is a 30-day, in-home trial so you can see how a rug looks in your house. Pricing starts around $30 for the smallest size. Anji Mountain Bamboo rugs come in a wide selection of different colors and sizes. The rugs are very easy to clean and come with a non-slip backing, which helps them stay in place on your floor. Pricing begins at about $40. With the wide range of products fashioned out of bamboo, you shouldn't have any trouble finding products that complement your home and style. Invest in some eco-friendly bamboo housewares and see how good eco-conscious style can look.